I was told it's a two fold problem. There's a run on fir for the cores, and our wonderful government is imposing a tariff on imported plywood. The stuff I use is domestic, but effected by both. Supply and demand. Do you think this is a short term increase, or will the price remain high? I think once it goes up it stays. They had an Earthquake in Chili that disrupted the supply of MDF in the US for a while year back. The price of MDF went from 65 cents to 99 cents a square. After the Chilian operations we back up and running the price only increased from there. Never went back down. If the tariffs go away, then the pricing might recede. Doesn't look good, short supply and a spat with Canada. One of my suppliers told me months ago that the tax on imports Trump put in place was going to make the import plywood I use for toe kicks go up significantly. I told him the domestic guys will greedily raise their prices as well, that is exactly what happened. Tariffs are always a tax on the consumer. Trump is dead wrong on this. Was paying $36 two years ago for imported 3/4" prefinished- good quality (better than any domestic I have found). Hit high 40's last year. I now sit at $53 for import (but limited supply until it runs out is the last word I had) and $56 for domestic. I've been told to expect right around $60 by someone in the industry I trust within a year. The Obama administration put the tariff in place. So lets say an average new home build is 50 sheets of 3/4 plywood. Probably high but for ease of math, 50. It goes up 20$ sheet over night. Your bid only went up 1000$ on a whole house. I'm not saying it isn't a little alarming, but it also isn't the end of the world. I dont make cabinets for a living, but I just made mine for my new house. 1000 +/- isnt gonna kill me. Heck contractors mark the hell out of stuff. Homeoweners have no idea what stuff should cost. Dont know how solid the info is but we were given the same info as Andy from our supplier. That if the prices were close due to the tariffs that the domestics were going to jump their numbers as opposed to getting the level playing field they were asking for. Our numbers have been holding up until last week but they said they are in short supply on several of their options. I get what cww is saying but that doesnt do much when your competetively quoting work and have jobs on contract and price and availability gets unstable. All the big builders have clauses in their contracts with their customers but they are not going to be so accommodating with their vendors even if youve got it in yours. We don't buy import plywood. We buy it because we'd rather keep guys in Oregon working than send our money off shore. We were Trump before Trump was Trump. We actually put our money where our mouth is. Same here. Domestic only. Im asking my customers to support local so I try to do the same with tool and materials purchases. That said, it gets a bit annoying when your supporting an industry by paying more and of course getting a better product but that industry complains that its operating on an unlevel playing field. Then when that playing field is going to be leveled for you like you asked, you then raise your prices again. They will undoubtedly whine that the reason they will raise their numbers is because theyve been operating all these years at unsustainable margins which is in my option hogwash. My prediction is this will be yet another instance where government steps in as asked by industry, government implements what industry asks, and industry gets its greed on and screws us all into the loop again. Trump should have had a firm conversation with all the parties and told them point blank that there would be UGE', UGE', repercussions, if they foul this up. Problem with tariffs is you got the government picking winners & losers. I thought that ran contrary to freedom loving conservative values patriots. No Tim you can't be wrong. Both Obama and Trump are Wrong about Tariffs. The Smoot Hawley tariff contributed to the Great Depression. This has happen before as soon as all the cabinet guys go back to melamine the price will drop. Remember the days when the push for melamine was is washable and it comes in different colors. White and black was the biggest sellers. In theory the reason for the tariffs is that the offending nations were putting money in the industry so their companies would be able to sell at an unfair price. Not free trade, and not able to be sustained over time. Their goal is to get a strong foothold in the market or put the competition out of business at which point they could charge what they like, you know a monopoly. I have not done deep research into this so I don’t know all the facts nor do I think you could get all the facts no matter how you tried. I do know I have friends in the automotive parts business working for Chinese companies and they say the government is aggressively supporting these companies financially. Is it the right thing to do? I don’t know. We enjoyed their pricing keeping the market down just like we enjoyed the stock market bubble until it popped. The Chinese government subsidizing auto parts manufacturers is no different than the US government subsidizing American Farmers. Without price supports for crops a lot of farmers would have to move into town and go to work in a cabinet shop like everybody else. The tariffs have absolutely nothing to do with anything other than a photo op to sell at a campaign rally to ensure an electoral college vote in Pennsylvania. Is like sending the national guard to the border to aim rifles at the Mexico. Is a succinct, easy to sell slogan to distract attention from the real foreign influence in our politics & economy. Consider for a moment the impact of tariffs on newsprint. Newspapers in our country are under tremendous assault. Newspaper companies are closing their doors every day. It takes advertising revenue to hire reporters. It takes reporters to maintain a free press. If the only place you have left to get your information is single silo sources then democracy as we know it will go away. The alternative to democracy is totalitarianism. Putting tariffs on newsprint is part of the campaign to make people believe all news is fake news. What this administration should be focused on is Russian influence in our elections, not distracting people with economic strategies that fit nicely on a baseball hat. Basic economics says that trade trumps all else. IOW any trade (even with tariffs) is better than no trade. Tariffs are a tax on the consumer. I don't think tariff on newspaper are the biggest problem that happen with the newspaper businesses being in trouble. Technology had a big part in changing the way we get our news just as our mail service has taken a hit and it not an attack on our free press its just change the way its delivered. If you don't keep up and change you are going to be limited on what you can do in this world. Tariffs do work but they also leave pricing wide open in a free market. The internet killed the paper. There is no denying that. When your in the middle of a build, the average consumer couldn't guess their monthy bill within $3000. I know I couldn't. And I have a good understanding of how things work. I guess my original point remains the same. Its a 1000 bucks. That's if you use 50 sheets. 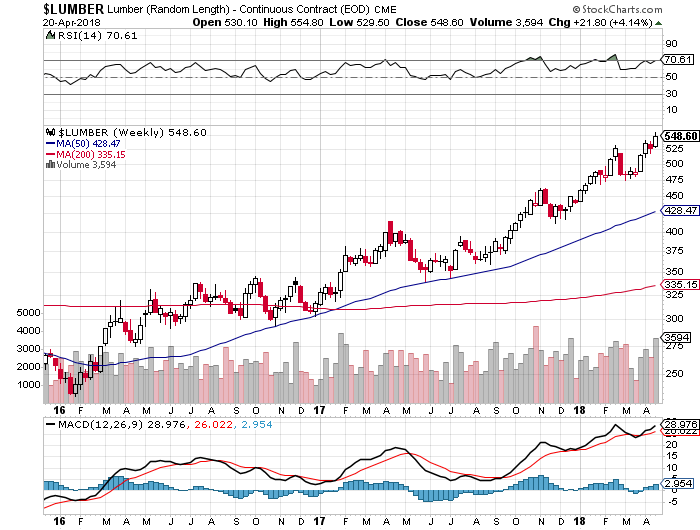 I am more worried about lumber prices. The Chinese are buying White oak like wild fire. Thus driving up the price in my area. What if they decide to buy ALL wood? They could. All the furniture companies make stuff out of all the species. What if they decide they want to buy all the paint grade poplar/maple? This would be WAY worse than the plywood. The Chinese are smart enough to realize you don't paint expensive hardwoods. Only stupid Americans paint Maple. The have plenty of Paulownia over there which is one of the best paint grade woods there is. It doesn't have any resins/tannins/sap/knots, and it's very inexpensive too. 3/4" China birch is still around $40 a sheet from my supplier, but I pay almost $60 for a domestic maple for paint grade as the Chinese stuff is potato chip, delaminating trash with a tissue paper veneer, voids, hair, string, and other junk in the core. Free trade doesn't mean much if it isn't fair trade too. This administration needs to focus more on unfair trade practices by China and hopefully put an end to the distraction of Russian collusion conspiracy theories. We have only used imported plywood and melamine and never bought domestic. There are different qualities in imports as well and my better suppliers have better product. We have had melamine with pieces of rocks flying out of it when cutting as well as nice quality cores with thicker melamine and only buy the better stuff. When the hardwood tariffs came into effect, the domestic plywood suppliers raised the prices as well. Big mistake. I am now getting a prefinished tiger stripe species from China that is way nicer than the prefinished Chinese birch at a LOWER price as it’s not classified as a hardwood. Looks great and customers love it! Free markets are not free. Free trade is not free. Tariffs are the stick of trade. The governments subsidizing their own private industries are the carrots. It is sometimes necessary to level the playing field. If dumping exists and is encouraged by one country its trading partners suffer as a whole. Being able to buy cheap goods is simply one beneficial aspect of trade. Trump is an idiot. His guys are using tariffs as a political stunt. Its all smoke, mirrors, spin, and mostly bs. Larry S, paraphrasing, the way to tell the quality of your material was to place on the router and run it at night, the poor quality material looked like the fourth of July. Milton Friedman used the analogy that if 3 men were in a lifeboat and one of them got out a gun and shot holes in the bottom of the boat. Tariffs are the equivalent of the other men getting out guns and shooting more holes in the boat. Trade is the oldest activity of man, older than prostitution, it literally built the modern economy. Monkeying with it is stupid. Before this age tariffs led to war. In Milton's analogy, the first guy shooting holes in the boat would be grave and extremely detrimental to all three. If the second and third guys response is like tariffs, then what is the equivalent economic activity of the first guy shooting holes in the boat? And how should have guys/nations 2 and 3 responded to that activity? I like Milton so just curious if you have more info on this particular analogy, thanks. The points is that tariffs hurt everybody including you. Look up the word comparative advantage. I suppose it could be said that the first guy was practicing mercantilism. The practice of limiting imports through tariffs. And devaluing your own currency. China did do this at first, which limited it's own peoples standard of living. Tariffs are a tax on the people of the country that places them. I don't think they suppress the value of their own currency as much as they did before. Apparently they still have tariffs. But it hurts them more than anyone. The notion that tariffs hurt our country is specious. It stems from the idea that the pie remains one size. It is ignorance of comparative advantage that causes this. The US has the lowest unemployment it has had in decades. Manufacturing is very strong, only slightly less than China's, with a much larger overall GDP. IOW where is Trump going to get the workers? If you want more on this just cut and paste in google, there is no shortage of stuff or read one of his books, though I would recommend Economics in One Lesson by Henry Hazlitt. I have to laugh how cabinet makers all become political experts over the price of a sheet of plywood. The cost is the cost at the end of the day. Keep your estimates to customers with shorter expiry dates so you don’t get burned to bad on increases and use what ever supplier or type of product that you prefer. The guy down the street from you is buying from the same suppliers so nothing to worry about. Have fun all.